Since I’m still having connection issues with my blog, I’m going to have to minimize my photos for a while to save space, sorry about that. Nothing worse than having blog issues. Anyway, for today’s recipe, I am making a tasty repeat recipe that I made last year. I have been waiting months to make this dish!!! Months I tell ya!! When I was at Sprouts Farmers Market the other day, they had butternut, spaghetti and acorn squash in stock. I was so excited that I bought all three. Ohhh yum, yum, yum, yum! 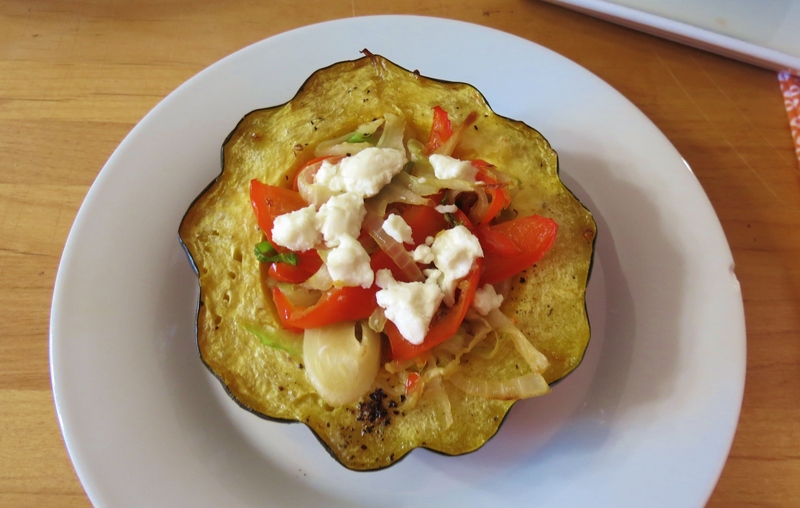 Tonight it was finally time to make my Acorn Squash stuffed with cabbage, peppers and onions. I just love this recipe!!! It’s so weird too, because I’m not a huge fan of cabbage! I think November of last year was probably one of my last times I had acorn squash. Oh how I missed it!! One big plus for the Fall season!! I originally got this recipe from one of Guy Fieri’s cooking shows. I don’t recall which one, but I remember back then, I checked Foodnetwork’s website and they didn’t have the recipe posted yet, so I kind of winged it. I think he added mushrooms to it, but I don’t like mushrooms so I skipped it. 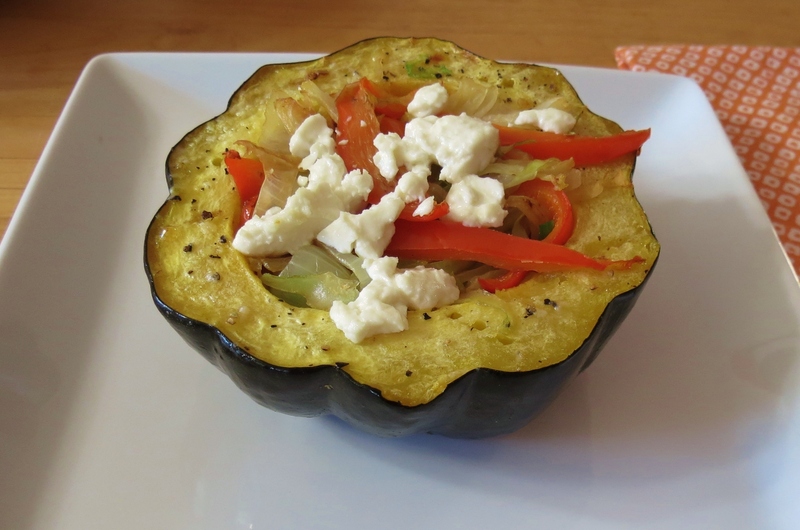 This acorn squash is savory from the cabbage, peppers and onions with just a hint of sweetness from the squash. The crumbled goat cheese is what really ties it all together. This is by far one of my favorite, favorite acorn squash recipes, plus it’s easy to make, which is a bonus. I changed up the calculations to the recipe a bit because the acorn squash I have is really small. Maybe a little bit bigger then a softball. I posted this recipe for two servings, but I ate them both for dinner. Hey it’s healthy and I was hungry!!! Honestly one half would not have been enough, if this is all you are having for dinner. I posted the original recipe here in case you would like to see the step by step instructions. The hardest part about making this recipe is cutting the squash. I cut the top and bottom so it sits flat on the baking pan, plus I had to cut it in half. Be careful cutting the squash!! You don’t want to cut your fingers! You could also roast the acorn squash seeds like you would pumpkin seeds, but since this squash was so small it only had a few seeds, I didn’t feel it necessary to add them this time. However, if you have a big one, make the seeds! 🙂 There healthy, yummy and add a nice crunchy addition to your meal. 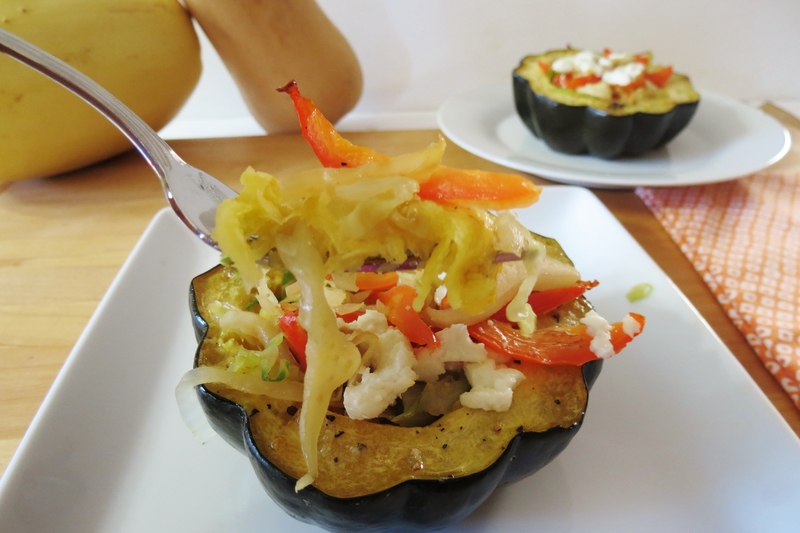 A sweet and savory acorn squash filled with cabbage, peppers and onions. Cut the top and bottom off of the acorn squash, then cut Squash Horizontal and scrap out the seeds and pulp. Spray the squash with cooking spray; then sprinkle with salt & pepper. Place on prepared baking sheet, faceside up and bake for 35-45 minutes or until tender with a fork. (Optional) Meanwhile, Clean the acorn seeds and place on a baking sheet, sprinkled with salt. Bake for about 7 minutes. In a pan, add peppers, onions, cabbage and butter and saute until soft and tender. About 8 minutes. Once squash is done, evenly place vegetable mixture into squash, top with goat cheese and bake until cheese is softened, about 5 minutes. Well, my Husband is gone for the evening, yah!! So that means I can turn on the oven and do some baking or maybe make some peanut butter, but first I have to do the dreaded dishes!!! So off I go! Oh, one least thing don’t forget to enter my Williams-Sonoma giveaway! Just go here. P.S. Do you like acorn squash? What is your favorite way to prepare it? My second favorite way is with butter and brown sugar or maple syrup! Yum!!!! So sorry you’re having blog issues, Jenn, that stinks! 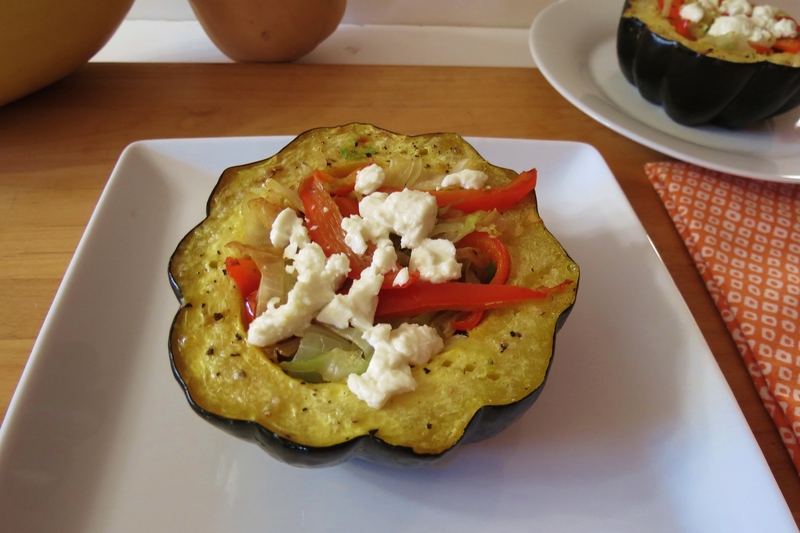 But your squash looks wonderful, love this combination and love the low calorie/fat count! I have never tried an acorn squash! I just love when you find special things at the farmers’ market. Great recipe! I live in on the Japanese island of Okinawa, and it’s tough to find certain ingredients. Thankfully, I can always find acorn squash, cabbage, and onion. However, the bell peppers are almost $5/pound! So I’m going to double this recipe but only use 1 bell pepper (which I’m sure won’t yield 1 cup, but maybe I have something else I can throw in). This will go great on the side of my extra-lean, chicken “fried” steak! Sounds wonderful Alicia! This is one of my favorite meals. I can’t believe peppers are almost $5.00 a pound! Wow!! I pay about a $1.29 for one pepper. I hope you enjoy it!